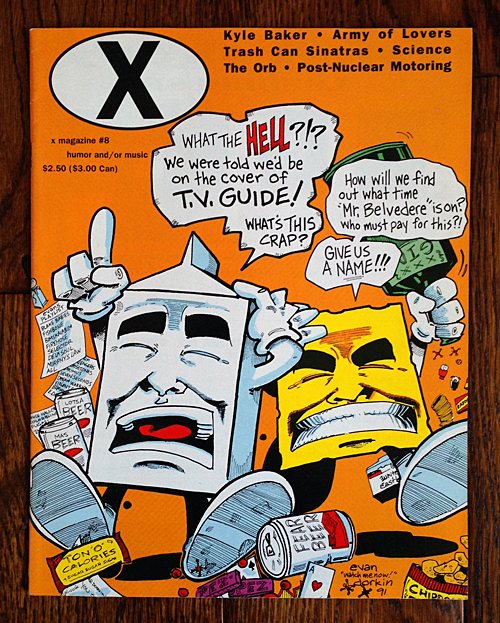 X Magazine was a quarterly humour and/or music magazine which was first published in March 1990, by Card House Productions in Michigan. 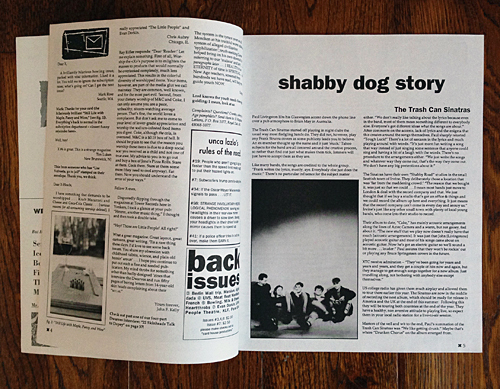 Issue number 8 from the fall of 1991, included a single page article on the Trashcans’ and features a phone call interview with Paul Livingston and Australian contributing editor, Brian May. Paul Livingston lilts his Glaswegian accent down the phone line over a pub atmosphere to Brian May in Australia. 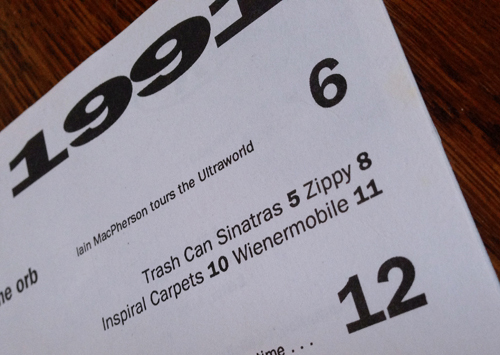 The Trash Can Sinatras started off playing in night clubs the usual way most fledgling bands do. They did not, however, play any Frank Sinatra covers as some publicity leads you to believe. An ex-member thought up the name and it just ‘stuck.’ Taboo subjects for the band are all centered around the creative process, so rather than find out just what makes them tick, listeners will just have to accept them as they are. The Sinatras have their own “Shabby Road” studios in the small Scottish town of Irvine. 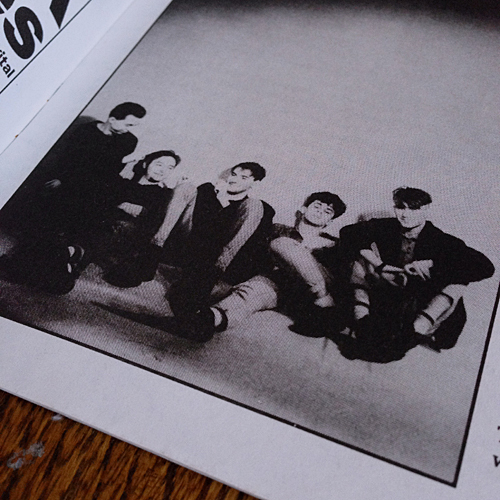 They deliberately chose a location that was ‘far from the maddening crowd.’ The reason that we bought it, was just so that we could … I mean most bands just move to London & deal with the record company and that. We just thought that if we buy a studio that’s got an office & things and we could record the album up here and everything. It just means that the record company can’t come in every day and annoy us.” Irvine’s just like any other small town with plenty of local young bands, who come into their studio to record. Their album to date, “Cake” has mainly acoustic arrangements along the lines of Aztec Camera and a warm, but not gooey, feel about it. “The new stuff that we play now doesn’t really have that much [acoustic arrangements]. It was just that John [Livingstone] played acoustic guitar and most of his songs came about on acoustic guitar. Now he’s got an electric guitar so we’ll sound a bit more … louder.” Paul assures that they won’t be rockin’ out or playing any Bruce Springsteen covers in the future. US college radio has given them much airplay and allowed them to tour there earlier this year. The Sinatras are now in the middle of recording the next album, which should be ready for release in America and the UK at the end of this summer. Following this they will be touring both countries at the end of the year. They have a healthy, non aversive attitude to playing live, so expect them in your local radio station for a live-to-air session. Masters of the veil and wit to the end, Paul’s summation of the Trash Can Sinatras was “We like getting drunk.” Maybe that’s where “Drunken Chorus” on the album emerged from.